Wee1 inhibition activates ATR and shows synergistic cancer cell killing with ATR inhibition. 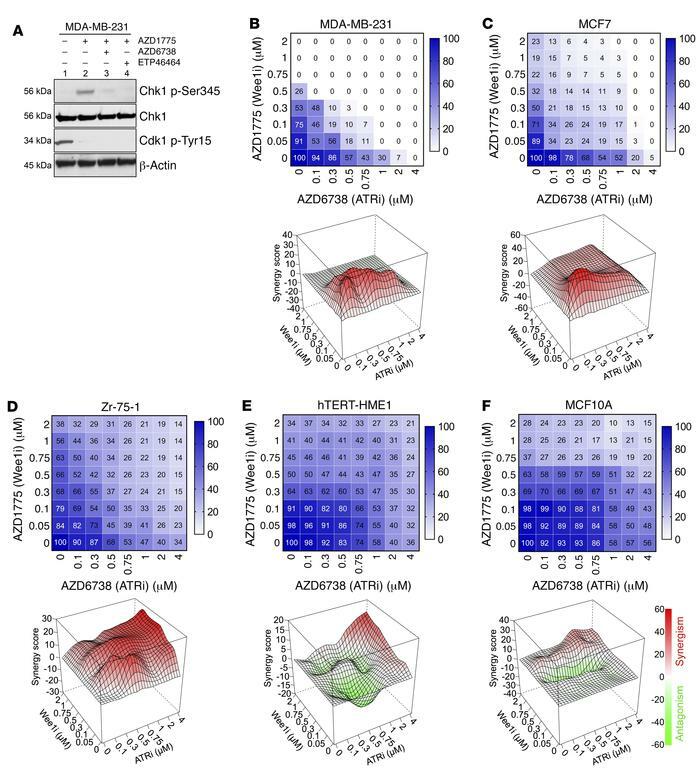 (A) MDA-MB-231 cells were incubated with the indicated inhibitors for Wee1 (AZD1775) or ATR (AZD6738, ETP46464). After 2 hours, cell lysates were harvested and probed for Chk1 and CDK1 phosphorylation by immunoblotting. (B–F) MDA-MB-231, MCF7, Zr-75-1, hTERT-HME1, or MCF10A cells were treated for 4 days with a combination of up to 4 μM AZD6738 and up to 2 μM AZD1775. Survival was assayed by crystal violet staining and each experiment was repeated at least 4 times. Color bars indicate percentage survival normalized to untreated cells. Representative cooperativity screens and Loewe plots for drug cooperativity are shown.